Altpick.com : News : Daniel Hertzberg's Gold Medal!! 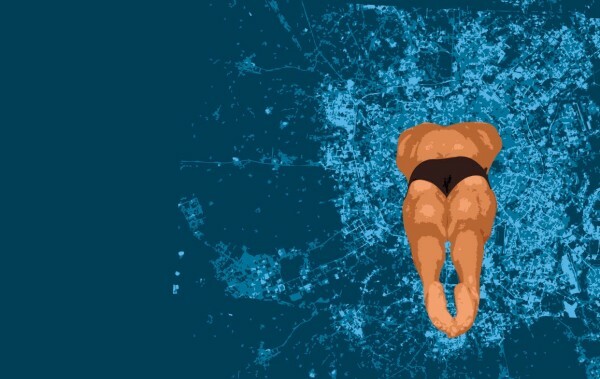 Gerald & Cullen Rapp artist Daniel Hertzberg has created a fantastic set of illustrations for Winning the Thirty Trillion Dollar Decathlon: Going for gold in emerging markets (2012), written by Yuval Atsmon, Peter Child, Richard Dobbs, and Laxman Narasimhan. "By 2025, annual consumption in emerging markets will reach $30 trillion--the biggest growth opportunity in the history of capitalism. To compete for the prize, companies must master ten key disciplines," including the anticipation of industrial growth, targeting urban growth clusters, and learning how to reallocate resources quickly (p. 4). The authors explain these economic concepts with athletic analogies (not surprisingly, given the current popularity of the Olympics). And Daniel Hertzberg illustrates these analogies with dozens of brilliant images. For the opening spread, Daniel depicts skyscrapers adorned with olympic medals. As he explains, "this is what happens at the end of the decathlon"--the most successful companies are rewarded with financial prosperity, and prosperity translates into enviable real estate space. 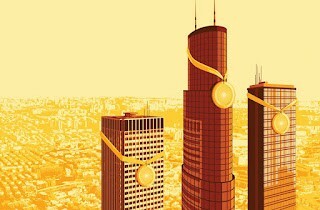 Remaining images depict businessmen throwing javelins, swimmers diving into city maps, and racers using mini skyscrapers as batons. Trillion Dollar Decathlon is full of insight, advice, and stunning illustration.